As of Monday, a whopping 2,506 bills had been filed in the Texas House of Representatives, and 1,100 have been filed in the Texas Senate. Narrowing down the list to transportation-related bills, you still have an unruly 445 pieces of legislation to sift through, according to the Texas A&M Transportation Institute. You can follow two different twitter bots to read about all the bills that keep being filed or the #txlege hashtag to see what people are talking about. How is a normal person supposed to keep up? That’s where Streetsblog comes in. To make it easier for you to participate in your democracy, we’re highlighting five good ideas and five bad ideas to watch in the 2017 Texas Legislative Session, starting with the bad ones. You can find out who your House and Senate Representatives are here and give them a call to oppose the bills below. Texas leads the nation in traffic deaths. Our current transportation system kills ten people a day and seriously injures fifty. Red light cameras and speeding enforcement cameras can reduce the death toll by making dangerous driving behaviors less prevalent. 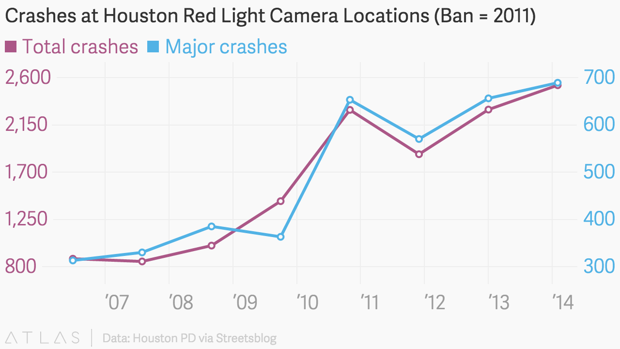 Following the vote to ban red light cameras in Houston, crashes doubled at the intersections where cameras had been removed, according to the Houston Police Department. Yet paranoid conspiracy theories appear to hold more sway with many elected officials than all the Texan life and limb that will be lost by limiting the use of these devices. Representative Mark Keough has filed HB 113 to ban all local governments from using automated enforcement, as well as HB 121 to make sure people who have not paid fines for running red lights or speeding can still register their vehicles. Representative Will Metcalf has filed HB 479, a seemingly identical bill as HB 113. On the Senate side, Senator Bob Hall is leading the charge for the conspiracy theorists. He has filed SB 88, which would prohibit all automated “photographic traffic signal enforcement,” even those used by school districts to try to make school buses safe for children. This bill has a companion in the House, HB 808, filed by Representative Pat Fallon. Senator Don Huffines has also gotten in on the act of prioritizing conspiracy theories over human lives and filed SB 111, which is similar to SB 88. Representative Oscar Longoria, on the other hand, appears to value the lives of Texas children and has filed HB 859 to facilitate school districts using automated systems to make riding school buses safer for children. Senator Lois Kolkhorst has filed SB 399 to block TXDOT from ever replacing a “free” lane of a freeway with a toll lane, one of several bills opposed to the idea that driving should be priced to reflect its costs, and that people should factor in those costs when making decisions about how to get around. According to my work on the Texas Transportation Equity Assessment, TXDOT redistributed about $5 billion of wealth from the Houston region to rural roads. And in general, driving is already heavily subsidized in Texas, with tolls and other user fees covering a small fraction of the costs of all roads. When Tom DeLay was Speaker of the House, he inserted a special reverse earmark in a bill, blocking federal spending for rail transit in Houston without passage of a referendum. The people of Houston voted for such a referendum in 2003, but U.S. Representative John Culberson learned DeLay’s tactics well and has continued to block transit between Houston’s Uptown — a dense, mixed-use downtown — and Gulfton — the most dense neighborhood in Texas – cutting both off from Houston’s light rail system. Now State Senator Konni Burton has filed SB 385, which would ban the use of federal funds for passenger rail projects in Texas, unless every jurisdiction the project would touch votes to approve the project. Those votes would only be valid for five years. This bill would very likely stop all new rail transit in Texas, and might even cause the removal of existing transit, as it applies to operations and maintenance funds that keep DFW, Houston, and Austin rail transit running, as well as the El Paso Streetcar (currently under construction). Texas Metropolitan Planning Organizations (MPO) are controlled by policy boards that do not represent the populations they purport to represent, as documented in my Texas Transportation Equity Assessment. Senator Donna Campbell has filed SB 198 to require all voting members of MPO policy boards be elected officials. The underrepresentation of women and people of color among Texas elected officials is well-known and documented. This bill would help maintain the lack of representation of women and people of color in the Texas transportation decision-making system. Representative Gene Wu has filed HB 812, a bill that bizarrely bans standing in roadways. This is in no way an exhaustive list, but a good place to start contacting your legislators today. Also, it isn’t all bad bills at the #TXLege. Coming soon we’ll follow-up with five good bills to watch. Glad you are weighing in on this. We need a healthy debate on this topic. Especially since it hits low income drivers so hard. Hi texas2a, ten people die every day in Texas transportation system. I appreciate your point of view on this issue and will look into what you’re saying. However, the reason I advocate for safer streets is that ten people die every day in the Texas transportation system and I guess I don’t agree with you on either the best way to reduce that number or whether that number is acceptable. How can we get a safe streets coalition together for voting? On the red light/school bus tickets: I am ambivalent on them, I do see some problems because they hit low income drivers so hard. I’d like to see a way for low income drivers to get their fine reduced. But in general I agree with you that they probably have a valuable place in creating safe streets. Hi Dave, What do you mean by voting here? Do you mean a coalition of legislators to vote in a certain way or a coalition of people to vote for certain legislators? There are a lot of good folks working on safe streets issues in Texas this year. There is not a streetsPAC in Texas as in some other places. There is not any kind of legislator coalition for safe streets. Some good questions, I’m not sure what I mean either. I would like Dallas and the rest of Texas to have more of a movement on this issue.